Retiring in Arizona was the culmination of RVing around the US for 6 years looking for a place to "retire"...our Arizona retirement story. 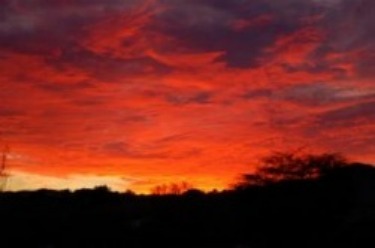 Another colorful Arizona sunset...from our backyard. We bought our home in Sun City Grand Surprise, Arizona in February 2004. Is it a great place to retire now?...You bet, you could buy right now the same house we bought in 2004 for the same to 20% more than what we paid for it then. Will this opportunity last long...I don't think so, the area has too much to offer for persons seeking a more active lifestyle in the sunshine. One of the things we liked doing was go to model home parks in our travels. You get exposed to a lot of different designs, floor plans, get decorating ideas and so on. We especially liked the Del Webb parks and visited them in Hilton Head, Sacramento, Las Vegas, Palm Springs before finding the Phoenix area. Our community was started by Del Webb, now Pulte homes. Our number one driver to retiring in Arizona was the climate, the active lifestyle ,and the low cost of new housing...and did I mention that Arizona is healthy. We have never regretted the decision. We live in a secure community with 4 golf courses (average cost per round, 75 rounds a year, is around $30, no cart fee). there a 2 main swimming pools, huge fitness centers, and more activities each day than there is time. 9200 families, over 55, are living the good life here. It was then and is now a great bargain...it's not to late for you to enjoy retiring in Arizona. 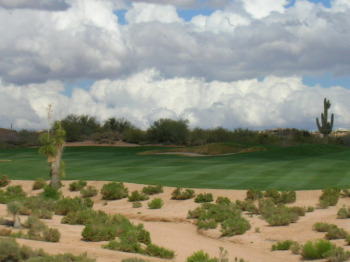 Arizona has 400 lush golf courses, just like the one you see here. This Desert Mountain course is one of six at the complex, designed by someone you may have heard of...Jack Nicklaus. Thanks to irrigation for sure...Arizona gets very little rain. Questions on taxes in Arizona? Questions on Arizona's financial health? Retiring in Arizona... why did we choose Arizona? Everyone is different and what is important to us may not be important at all to you. This is why we moved here...take what you can use and discard the rest. Everything is a trade off, there is no perfect place to retire, but retiring in Arizona offered the best compromise of all that was important to us. If we could stand cold winters, there is no telling where we might be. But we can not stand the cold. The last time we skied was our honeymoon, 34 years ago. 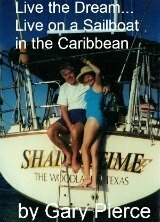 Every vacation since has been in a warm climate. Arizona offers warm winters, out door living for a good part of the year and something I don't miss about the south is humidity and bugs. You don't know how pleasant it is to go outside and not smell of DEET. It is also a pleasure to not have your shirt stick to your back the minute you leave the AC inside...we can't stand AC either but that is another story. The desert is really a very beautiful place...full of color. Oh and did I mention that crushed rock does not need to be mowed? You don't have to listen to the sounds of a lawnmower... There is peace in our neighborhood. You can get all the temperature info you want from other websites. The bottom line is you have no use for a winter coat and can play golf in January with a light windbreaker over your shirt. 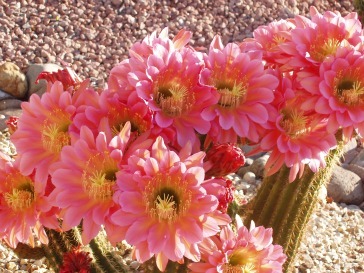 A source of constant amazement to folks (like us)...who had never lived in the desert is a blooming cactus like this one.The desert is really a very beautiful place...full of color. A common misconception is that Arizona is all desert. The major cities, Phoenix and Tucson, are desert but are surrounded by mountains pine forests and cold winters. There are 2 areas, Flagstaff and the White Mountains (eastern part of Arizona), that offer skiing. Flagstaff is almost 7,000 feet in elevation and 2 hours from Phoenix. Any baseball fans out there? Spring training in Arizona...half the major league teams are here in Arizona for spring training. As we speak it snowed in Flag 3 days ago and we had our first 100 degree day in the Valley (the Phoenix area). So you want variety in climate you got it in Arizona. Take a look at a topo map, you will be surprised at the mountains in Arizona. Tired of mowing the grass? In our community of 9800 homes, our rules and regs call for sized gravel to be the ground cover not grass. 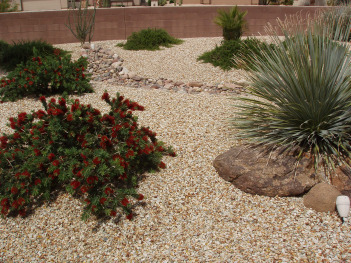 It makes for desert landscaping and no sounds of lawnmowers disturbing your peace. Works for us folks. All plant watering is done by drip systems installed underground. No sprinklers needed in Arizona...except for the 400 or so golf courses throughout the state. Go figure we are in the middle of the desert and our golf courses are lush year round. Thank you Colorado River. If you are somewhere else and want to enjoy the Arizona sun there is no reason to continue chopping wood. I am talking about park model living. You can buy a nice 400 square foot home for $20,000 or less and be surrounded by thousands of people doing the same thing you are...enjoying retiring to Arizona. Here is some up to date info on this great way to live cheaply and well. I'm sorry the I can't afford retiring in Arizona is just not true. Anyone can afford park model living and the activities are equal to any active adult community you can find in the state. 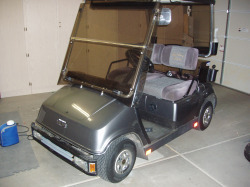 Our second car is a golf cart and yours may be the same when you retire to Arizona. They are legal to drive on all streets with a speed limit of 35 MPH or under. You can cross streets with higher speed limits so there are lots of places you can go with a golf cart. We never miss the second car and a golf cart uses very little fuel. Ours is 48 volt electric, you can get them with gas engines, they just make a little more noise. They are also way cool with our 7 year old nephews when they visit. Here is a link for more specific information on which Arizona city may be right for you. Prejudiced...guilty on all counts. Retiring in Arizona was the result of 6 years of RVing all over the Southern and the Western parts of the US. we did our homework and Arizona offered us the best combination of home value, activities we enjoy and great climate. Come join us.